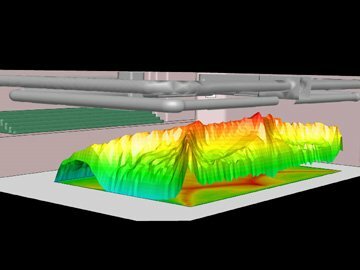 CFD analysis of air flow, humidity, comfort temperature and chemical loading in moist environments associated with natatoriums. Studies of optimal ventilation system design. Analysis of airborne chloramines and their control. Analysis using profiles and contours to show the concentration of chloramines in the inside environment. CFD is regularly used to calculate and visualize airborne chemical contamination, temperature profiles and air currents within natatoriums.